Molasses Flavor, Carrot Flavor and Spiced Apple Flavor Rounders® Horse Treats are a highly palatable treat for all horses. Hand feeding Rounders® Horse Treats helps build the trust necessary in establishing a close, long-lasting relationship with your horse. 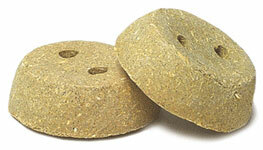 Rounders® Horse Treats are the best choice for your horse. Fortified with vitamins and chelated trace minerals.